What is normally an eight-hour road trip from northwestern Pennsylvania to the Chicago area stretched into twelve hours for nine students and two chaperones from the Newman Association at Allegheny College in Meadville, PA. Arriving four hours later than expected due to snowy conditions and an unfortunate encounter with a ditch, the students prepared once again to spend the last week of their winter break with Sisters of the Holy Family of Nazareth (CSFN) in Des Plaines, IL, learning and serving. Rather than sleeping in or vacationing in warmth and sunshine, these students spent the week helping to serve the homeless dinner, packing meals at Feed My Starving Children, sharing time with elderly residents at Nazarethville and experiencing Nazareth spirituality and hospitality. They also spent time at the Viator House of Hospitality, learning about the plight of our immigrant brothers and sisters while listening to the stories of the young men who live there. Among the highlights of each year’s trip is a visit to the cloistered nuns at the Carmelite Monastery where the students walked away in awe at the connections they make with these religious women who live a life so different from their own. Toward the end of the week, the students joined CSFNs for a Holy Hour at the provincialate chapel where they shared reflections about their week. Zach Shomo, a senior at the college who has made this trip four times, described the time with the Sisters as his “spiritual reset button.” He talked of how being in the presence of Sisters gave him the “strength and courage” to support his faith. Nikki Hawk, also a senior at Allegheny College, reflected on how Jesus can be found in simply talking with someone. “A faithful and loving presence brings happiness and healing,” Nikki said. This was her third visit to the provincialate. 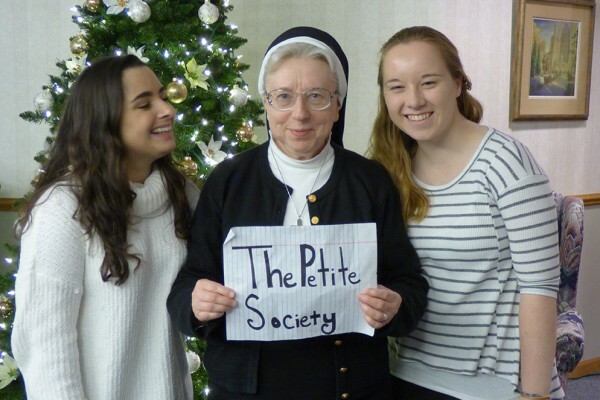 She, along with Maggie Donaldson and Sr. Clare Marie Kozicki, formed what they lovingly called “The Petite Society,” a society for who are smaller in stature. Maggie Donaldson, a senior and recently converted Catholic, spoke of how she felt at home among the Sisters, while Vicki Bajek, a freshman, said she was jealous of the Sisters relationship with God. “I see what I’ve been missing,” she shared. “Simple things can become prayer,” Sam Qualigana, a senior who was on the trip for the first time, observed about his time with the Sisters. The snow that delayed their journey earlier in week reappeared. After a “play day” in Chicago, seeing the sites, the group cut their trip short to make it out ahead of another snow storm. No need ending up in a ditch twice. As the students and chaperones loaded up and drove back to Pennsylvania, Sisters prayed them home safely and wait joyfully to welcome the group back “home” to Des Plaines next winter break. If you are interested in short-term or long-term volunteer opportunities with the Sisters of the Holy Family of Nazareth, please visit Holy Family Service Corps. To learn more about the Allegheny College students’ time with the Sisters, we invite you to read Sr. Theresita Donach’s January 10 and January 17 Wednesday Reflections.